For two years I managed this site from the hours of 9-6. Like many big companies, they were hesitant to change what was working. But change the site we did. 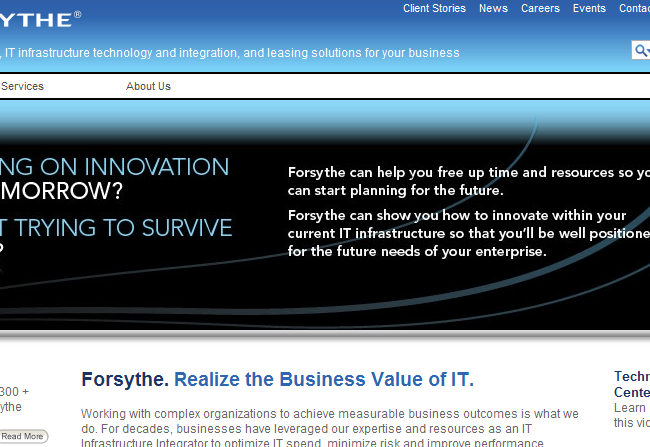 Forsythe was my employer for many years. For two of them, I was the Interactive Media Specialist. Through small changes, we were able to make the site more SEO friendly, introduced the company to analyzing their web traffic, added video content to the website, improved the user segmentation of the site, and vastly improved the management process. I worked not only on the external site, but a private website for employees only – the company intranet. There is a wealth of cases and success stories from managing portions of the intranet. But I cannot show those private pages. I can only show you the public work completed. My title at Forsythe was Interactive Media Specialist. That is a broad title, with much grey area that can be included. Which is why many graphic and web projects were bundled into it. But one thing was clearly in my title – video on the web. Often a project requires many roles. In this project, I acted as a project manager and designer. And as a designer, I was utilizing user experience skills and SEO skills. There was significant research and analysis done to justify a change like this to a large corporate site like Forsythe’s. Improved process for repetitive tasks – ex. creating map of locations, streaming video, homepage ads. Non-technical staff could better maintain frequently-updated pages. Trained nearly a dozen people to maintain the site. Received many compliments about training skills, including from the training department of the company. Was on a committee run by the IT department to create new web templates and ensure their adoption across the company. Your site can have the best content on the internet. But if people cannot find it, they won’t spend the time to look for it. We took several actions to improve not only Search Engine Optimization (SEO) for external sites like Google or Bing, but to improve our own site’s search engine. When considering user experience (UX) design, a web designer should realize that a well-placed search bar can be more helpful than the most intuitive site navigation. Email marketing is an often overlooked part of design and marketing. Not as glamourous as websites, nor as permanent, email design is a tough skill to manage. In my experience, many designers claim to know how to work with email. Yet when the end designs are tested, there are several issues designers often overlook. On separate occasions, company sponsored training in iMovie and Podcasting by Columbia College Chicago on personal hours. Purchased $15,000 of video equipment to create a video studio/production/editing studio on site. Managed equipment and studio use across the company. As a result of research I did into the emerging trends of web design, Forsythe embarked upon a project to change the home page of their website. Simple right? Not really. In large companies, especially those who consider their website to be a sales tool, change is slow, must be well-justified, and the result thoroughly tested.